Royal Tree Lodge is a small Lodge ideally situated away from the bustle of Maun, perfect for the more discerning traveler. The main thatched complex consists of bar, lounge, entrance hall and dining. The Lodge consists of seven large Meru style tents, each with en suite toilet facilities, simply furnished but stylish and attractive. All tents are on decks, surrounded by trees and are well spaced for privacy. The addition of 2 Honeymoon cottages allows the Lodge now to accommodate 18 persons. The Honeymoon Cottages are thatched with a unique outside shower set and an en-suite large circular bath with stunning views. 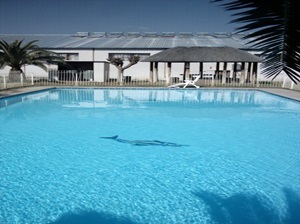 The lodge offers a swimming pool with sun loungers as well as three marked walking trails. Activities offered: Scenic Flights over the Okavango Delta in either a fixed wing or helicopter can be booked on a per hour basis. A morning tour of a local village. See how the locals live, what they eat and how it is prepared. Listen to their stories and share a window into their lives. The hotel is situated in the city of Maun and consists of, 6 double rooms, 20 twin rooms and 4 suites / family rooms all air-conditioned with en-suite bathrooms, a limited bouquet of satellite television, tea and coffee facilities, room service and laundry. 3 deluxe riverfront suites all with private verandahs are en-suite, fully air- conditioned with double beds and comprise of a tastefully furnished lounge area, and they boast a full bouquet of satellite television. Separate bath and shower and 3 WC’s and hand wash basins. Tea & coffee facilities as well as room service and laundry facilities are available. The presidential suite has a king size bed and includes a fully stocked bar. For those with a limited budget, the lodge offers 12 thatched chalets offering excellent value for money. The chalets are all en-suite, fully air- conditioned with tea & coffee facilities and local television, 8 of the chalets cater for families with 2 beds and a double sleeper couch. The remaining 4 have 2 beds each. The A la Carte restaurant offers a full menu and a range of daily Chefs specials together with international and traditional cuisine. The Boma, an open air traditional bar and restaurant offers local dishes including the famous barbeque as well as a light snack menu. 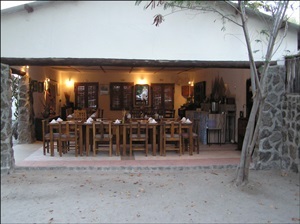 The Pygmy Goose Bar is an ideal rendezvous spot on route to the A la Carte restaurant to enjoy a sundowner. Audi Camp is 12 kilometers north of Maun, on the road toward the Moremi Game Reserve, located on the banks of the Thamalakane River – the southernmost tributary of the Okavango Delta. The lodge offers luxury en-suite tents on raised wooden decking overlooking the river. Mini-Meru tents with beds, lights their own fire places and cooking area. Large dome tents with stretcher beds. The lodge also offers shaded camping areas with power points at some sights. Also available at the lodge is a bar and an a la carte restaurant. Moremi Game Reserve covers approximately 50,00km and must be rated as one of the most beautiful reserves in Africa. It is named after Chief Moremi who was instrumental in getting his people to set aside the land in 1963. Moremi, where the bushman hunted as long as 10,000 years ago, was initiated by the Batawana tribe and covers some 4,871 km, as the eastern section of the Okavango Delta. 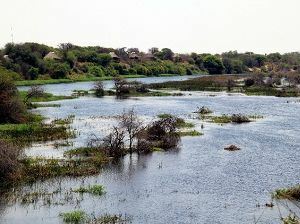 It combines mopane woodland and acacia forests, floodplains and lagoons. South Gate is approximately 100km from Maun and forms the southern entry point into the reserve. The area tends to remain dry. It does have a public campsite however there are no camps or lodges at south gate and the road network is very limited. 3rd Bridge a trip to Moremi is not complete without a visit to this beautiful area. Game is plentiful, the birdlife is excellent and you should spend at least two nights at Third Bridge. Lions often come into camp at night and they regularly cross the bridge. One can see Leopard, Cheetah and Hunting Dogs in the area and there are always Elephant and Hippo around. The Baboons are a bit of a problem. Make sure you do not leave any food in your tent. Provided there is no food inside, they will usually ignore the collapsed tent. There are ablutions but no other facilities. Northgate or Khwai is situated on the northern border of the park, en route to and from Savute. The Northgate area can literally pump with game at certain times of the year and is well worth a visit. Chiefs Island is pretty much closed to the public but there are some top quality lodges that can only be accessed from the air. Chiefs Island is one of the very few areas in Botswana where one is almost guaranteed of finding the Big 5. As the island is inaccessible by road it tends to be very private providing an unrivalled game viewing experience. The area is renowned for its population of bull elephant and for the unique interaction of the resident predator species. All suites have private decks, combined bedroom and sitting areas and en-suite facilities. 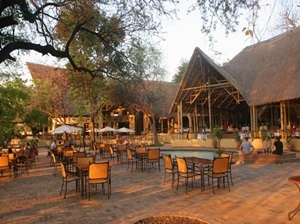 The sitting area, library and cocktail bar are situated in an exquisite thatch and timber main building. Savute boasts a viewing deck, an al-fresco dining area and swimming pool – which is ideal for watching game at the waterhole. Open 4x4 game drives are conducted in the Savute area, including the famous Savute Marsh, and the ancient San rock paintings at Gubatsa Hills, add magic to a delightful African safari. Savuti Camp is situated in an isolated part of the Linyanti Concession along the Savute Channel. The site of Savuti Camp is about 17 kilometers 'downstream' from the Zibadianja Lagoon - the source of the Savute Channel. This intimate camp's en-suite accommodation is in seven large walk-in tents that are raised off the ground and face onto the Savute Channel. From the camp's thatched dining area, a plunge pool and large viewing area with fire pit a wonderful view of the Savute Channel and its wildlife is provided. Explore the Savute Channel and its environs through day and night game drives, nature walks with a guide (on request), and several well-positioned hides for safe, up-close animal viewing. 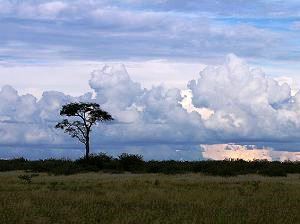 In the heart of the Chobe National Park is the Savute. Perched on the banks of the Savute Channel, the Savute Elephant Camp offers a spectacular bird eyes view of elephant in their natural habitat. All luxury tents are housed on raised wooden platforms, offering great views, and shaded by a traditional African thatch roof. The large private decks are furnished with easy chairs and a hammock, ideal for viewing wildlife, or for enjoying a private dinner in complete privacy. The tent interiors are luxuriously appointed with en suite bathroom, private fully stocked mini bar, four poster bed complete with mosquito netting, as well as a discreet air conditioning. 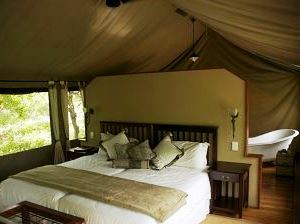 The 12 twin-bedded luxury canvas tents feature en-suite bathrooms and dressing areas. They also have private viewing decks and comfortable outdoor lounges overlooking the Channel. For your convenience, in-room safes are provided for the safekeeping of all cash, travel documents and other articles. Facilities offered are an observation deck area, just 10 meters from the adjacent water hole, 20 meter elevated Swimming pool area, overlooking the riverbed, private Outdoor dining area – the ‘Boma’ ideal for special events and entertainment. Private outdoor leisure area internet access and satellite TV located discreetly away from the main lounge and dining areas. Satellite phones on request, high powered telescopes for star gazing, same day laundry service, Curio shops with essential toiletries, safari wear, local art and craft objects, reference library of books and videos, audio-visual facilities, VHF radio communications plus 24 hour emergency facilities. The camp offers game viewing activities in the morning and late afternoons. These activities take place on a safari viewing vehicle. 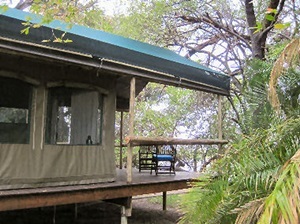 Ihaha is the new and only camping site for private visitors within northern Chobe. Earthwork ramparts effectively surround the site, so one has to turn away from the river road and pass through the main camp office to get to the site. The ablutions here are a great improvement on Serondela's, consisting of two tall, whitewashed, thatched buildings, each with two showers, two toilets and several sinks for men and women. The ablutions are clean and there is hot water and lights (solar power). Each camp has a barbeque stand, a refuse bin and the view is beautiful. 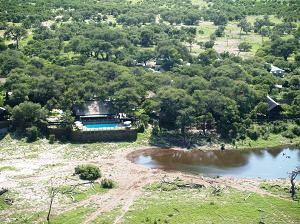 Kubu Lodge is a privately owned and run lodge on the banks of the Chobe River. 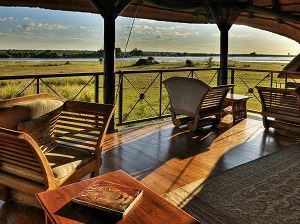 Kubu Lodge has eleven charming chalets, all thatched and raised on stilts to give panoramic views of the Chobe River and they overlook a shaded lawn that spreads beneath giant ebony and wild fig trees to the river's edge, an idyllic setting. The rustic exterior belies the comfort within; full en-suite facilities, ceiling fans, mosquito nets, tea and coffee making facilities and comfortable beds. Facilities offered are a bar, curio shop, game drives, boat cruises, nature trail for bird viewers, and a private secluded swimming pool. Chobe Safari Lodge is situated on the banks of Chobe River and sharing a border with Chobe National Park and beeing part of the meeting place right on their doorstep of Botswana, Namibia, Zimbabwe and Zambia. The lodge offers 46 safari rooms each with air-conditioning, en-suite bath and shower facilities, as well as satellite TV, and telephone. Each room has its own patio that gives one the privacy of enjoying views. 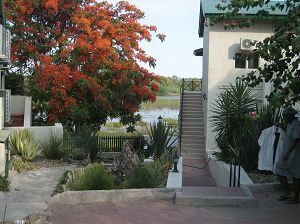 The river room complex also has its own riverside garden where guests often meet the resident monkeys and mongoose. All units enjoy their own private patios. 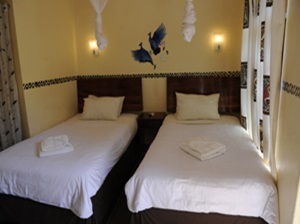 The rooms are air-conditioned and offer the convenience of phone, TV and en-suite bathrooms. Family rooms include two twin bedrooms. 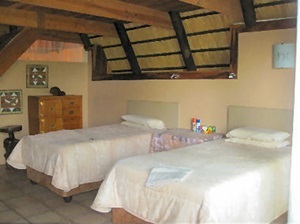 The traditional thatched rondavels are independently positioned, with ceiling fans and en-suite bathrooms. These detached units are positioned close to the river in the lodge gardens. The lodge features a restaurant, and two bars. Dine under the stars on board of the boats FishEagle II or Kingfisher II cruises on Chobe River between the shores of Botswana and Namibia and turn your evening meal into an unforgettable occasion. Activities offered: Game drives, depart 3 times a day; Alternatively there is an option of booking a full or half-day drive with a picnic lunch; Chobe River cruises have to be one of the finest game viewing experiences in Africa. Water Lily Lodge is situated in Kasane and caters for a maximum of 20 guests. Accommodation consists of 10 air-conditioned double rooms with en-suite bathroom and toilet, DSTV and swimming pool, bar and restaurant. 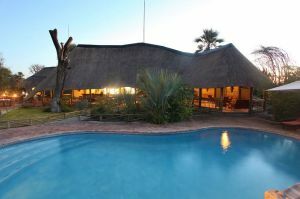 Thankfully, the funkiest bar and the coolest pool in the Kalahari await your pleasure. Just a stone's throw from the camp is the elephant's paddling pool. At Planet Baobab, you can sleep in traditionally styled Bakalanga huts with en suite showers, curl up in a Baobab hut which share the best ablution blocks you'll ever see or pitch your tent, or park your 4 x 4. Enjoy Planet Baobab's unique Pan-African cuisine. A bar menu is also available and the lodge is vegetarian friendly! Situated in the town of Gweta, close to the Makgadikgadi Pans National Park the public areas include a bar, lounge, pool, open rondavels, an outdoor kitchen, a restaurant, a curio shop, and a boma fire pit. The comfortable accommodations include two luxury rooms, family rooms for four or more guests, double rooms with en-suite showers, and traditional thatched-roof rondavels. There are also camping facilities and an ablutions block with hot showers and toilets. This National Park has recently been extended to incorporate the area surrounding Baines's Baobabs. The main focal point of the Park is Nxai Pan a large grass covered pan. The Pan attracts a number of plains game such as Gemsbok and Springbok and the surrounding bushveld provides habitat for Giraffe, Kudu and Impala. The Pan provides perfect habitat for Cheetah and the waterhole on the Pan provides the focal point for interactions between Lions and their prey. Wild Dog can occasionally be seen here and Elephant often come this far south in the summer months. The Baines Baobabs are a series of majestic trees dominate a small island and overlooking the KudiaKam Pan. 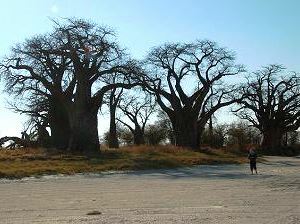 The Baines’s Baobab is actually a group of 7 giant baobab trees. This cluster is commonly referred to as the ‘sleeping sisters’. The Baines’s Baobabs have been incorporated into the Nxai Pan National Park to ensure the protection of these trees in the future. Nxai Pan Camp. It is a uniquely styled camp, overlooking a waterhole on the edge of the Nxai Pan. The Makgadikgadi Pans National Park was set up to protect the fragile environment around the Salt Pans. A controversial fence has recently been built to prevent the Lions from leaving the Park. Bordering the Boteti River in the north and covering the northern tip of the Makgadikgadi Salt Pans in the south, this park is well worth exploring. The northern section along the Boteti River is wooded with lush vegetation. The Zebra migration from Phuduhudu to the Khumaga area of the Park is one of the highlights. 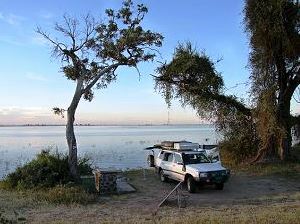 Khumaga campsite has 5 campsites and is pleasantly situated overlooking the Boteti River bed. There is no water available at Njuca hills and Khumaga. The camp site is well developed, with sit-down flush toilets, cold showers and running (nondrinkable) water. A 4WD is needed to drive around the park. Meno A Kwena Camp offers a traditional tented camp with views of the dry Boteti River bed. Mini meru walk-in ridges accommodate 2 people with beds and bedrolls made out of linen. Each tent has a bucket shower and bathroom with flushable toilets. The atmosphere at this Botswana accommodation is tranquil and promotes relaxation. This is the largest game reserve in Botswana and at almost 53,000 sq km is the second biggest in the world. Situated in the centre of Botswana the reserve can be accessed either from the east near Rakops, the west near Ghanzi or in the south through Khutse Game Reserve. The Kalahari is renowned for its impressive black-maned lions and the habitat of wide open pans makes this reserve one of the best places for seeing Cheetah . The park has a number of campsites but no facilities are provided. Sunday Pan: There is always game in the shade of the Acacia trees and there are often Lions in the area. The campsites are situated on low hills overlooking the pan. Piper’s Pan: This is one of the areas with the most game, providing the pump is working. It is worthwhile to do a day trip there, but it is even better to stay over for the night. Deception Valley is all that remains of a sprawling riverbed. The low canopies of these tree grove islands, usually made up of umbrella thorn (Acacia tortilis) and buffalo thorn (Ziziphus mucronata) provide shelter for game during the heat of the day and one can often see lion dozing in the shade of these thickets. The Nata Lodge is an oasis set among the Mokolwane palms on the edge of the pans. It is situated close to the entrance to the Nata Sanctuary and is just 10 km from Nata village. All chalets have custom designed ceiling fans and in room safes. Of the 20 chalets, 8 chalets are set on a raised platform that overlooks the old Didibakwe river and are built on the northern boundary of the lodge under the dappled shade of the Ilala Palm trees. Of these 8 chalets there are 2 Luxury Chalets on offer. These boast majestic outdoor showers and ball and claw feature baths. 12 A-framed stoned thatch chalets are set on the southern boundary of the lodge. These unique chalets have semi open bathrooms and stoned verandas. 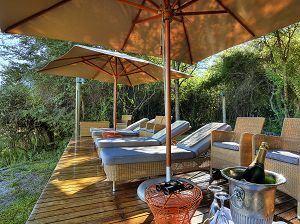 10 luxury safari tents are built on raised wooden platforms which are nestled under the lodges many Marula trees. These unique tents feature en suite bathrooms and all amenities offered in any of the lodge’s chalets. The campsite is able to accommodate 150 pax and the ablution area’s are stylish with semi open showers offering hot and cold water but does not have electricity points. The lodge offers a pool deck, open bar and a restaurant. 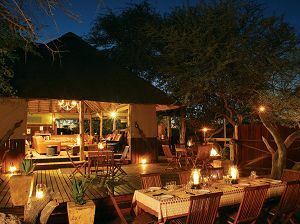 Haina Kalahari Lodge is located on the northern border of the Central Kalahari Game Reserve. Classically African, relaxed and informal accommodation is offered in luxury safari tents. The Main Boma consists of a lounge, dining room and bar area decorated in wood and thatch. A swimming pool, sun deck, well-appointed bar and an expansive boma eating area are among the facilities available to visitors. 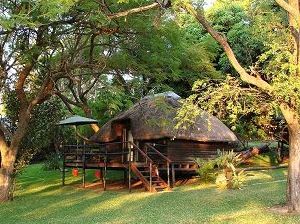 The Lodge accommodates up to 20 guests in tented accommodation which are all private with their own decks. The 6 Luxury tents consist of a bedroom and en-suite bathroom with shower and toilet. Three of the Superior Luxury tents have thatch roofs, large decks and full bathrooms. The family tent has been built around the trees and it has 1 king-size and 2 3/4 - ideal for families. 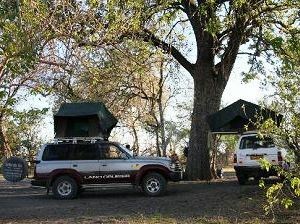 Mobile overnight and day trip safaris are offered into the Game Reserve. 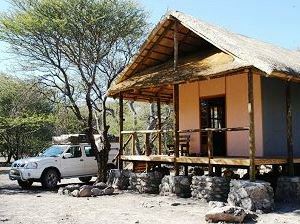 The Thakadu Bush camp is situated in Ghanzi. The people living in this area are widely considered the last genuine Bushmen on earth. 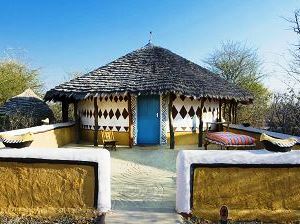 Guests at the Thakadu Bush Camp can choose between a basic campsite, or one of our luxurious Meru tents. The Meru tents come in double or single and have en-suite facilities. The campsites are shaded by the plentiful Leadwood trees that thrive in the Limestone ridge which runs through the property. Game drives with knowledgeable guides are recommended! Night game drives are also recommended as guests will have the opportunity to see many of the nocturnal creatures that live here. Awake to the birdcalls of the Kalahari and prepare yourself for a day in the bushveld. Ghanzi Trail Blazers caters for visitors wishing to have a genuine glimpse of a fast disappearing unique and ancient culture. The recreated San/Bushman grass huts have been suitably modified for your comfort yet still offer an exciting experience. In each hut we have stretchers with mattresses, lights and mosquito nets. Also available are communal ablutions with flush toilets and hot showers. En-suite accommodation in chalets (14) set in a simple yet original background of the African bushveld. The chalets have a “Kgotla” to sit around at night and enjoy evening stars. For the camper spaces (6 camp sites) have been cleared to put up a tent for the night, and fireplaces to sit around on cold winter nights. 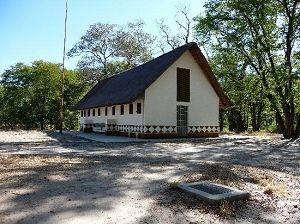 At the campsite there are communal ablutions with flush toilets and hot showers. Meals are served in the restaurant and a bar is available for the thirsty. 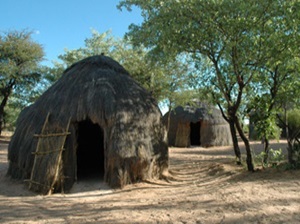 Tautona is situated near the Village of Ghanzi on its own private game reserve. Tautona, meaning big lion in Setswana, is situated on a 10 000 hectar private game farm. The lodge also has two swimming pools for those hot, lazy summer days, so that there is plenty of possibility to relax. 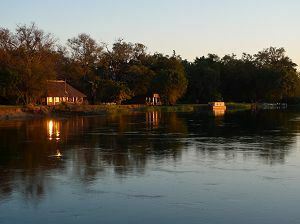 The lodge stands on the bank of the Okavango River, a little less than 3km east of the main road. 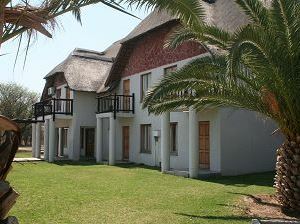 The lodge offers ten large, thatched, brick bungalows. Each has a fan and mains power throughout, and an en-suite bathroom. There's a circular thatched boma, used as a bar/dining room, adjacent to a small lily-covered lagoon that's behind the splash pool. Under shady trees on the river bank, a few meters south of the main lodge, is the campsite. This is a lovely, grassy site with simple ablutions and a few metal drums that act as braai stands for cooking. Drotsky's Cabins are situated on the banks of the Okavango, overlooking the wide river, dotted with floating papyrus reeds. Drotsky's six chalets are set under a canopy of thick riverside trees. Two of the chalets sleep two people, whilst the other three are bigger and built on two levels, and can sleep a maximum of five. 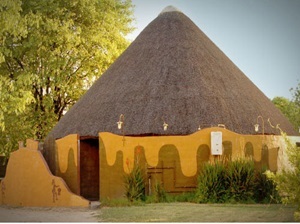 All are an A-frame design with low brick sidewalls supporting a tall, steeply angled thatched roof. These are insect-proof with mesh on the windows and lit by main electricity. They all have simple furnishings, rugs on the floor, and a tabletop electric fan. Central to the lodge is a bar and a very large dining area, built over the river. Drotsky's Cabins stand on a high bank, overlooking the river, which is already several kilometres wide. Below is a network of deepwater channels and large beds of papyrus. It is excellent for bird watching or fishing. Xaro Lodge has 8 luxury spacious en suite meru tents sleeping 2 guests. The tents have been specially designed with glass doors in the front of the tent. Each "tent" is on leadwood decks and all have views of the Okavango River. There is a dining room, bar and swimming pool. Enjoy pre-dinner drinks around the open campfire and after dinner enjoy a cigar and brandy with new found friends. Xaro Lodge offers a number of pathways for bird walks. Keep a keen eye out for the elusive Pel's Fishing owl and his nest. Take a motor boat trip for fishing, birding or photographic opportunities.